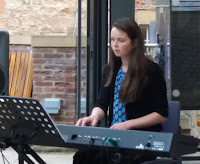 In recent times Durham University students have revitalised Durham City’s jazz scene. Gigs are up every cobbled street, around the next corner into an ancient chare, even in an empty shop. Ah! Not ‘an empty shop’ make that ‘The Empty Shop’ - the one on Framwellgate Bridge. Durham University Jazz Society set up a regular jam session on the first floor, it went from strength to strength, and, in part, inspired the idea of a jazz festival…DJazz its name. One student (a music student!) accepted the offer of a gig at DJazz 2018 – you would, wouldn’t you?! – and set about putting together a trio for the occasion. Pianist Juliane Deil has been heard around town over the last year or two and her DJazz gig in the Courtyard Café attracted a standing room only audience. The sun-dappled, airy café within Palace Green Library offered teas, coffees, something alcoholic if so desired, and a selection of tempting cakes and scones. Juliane Deil came across as a quiet, shy individual and it was a little while until she spoke to the audience. Perhaps not a bad idea to let the music speak for itself! Accompanied by five-string bassist Gavin Jackson (another active DU Jazz Soc musician) and a youthful-looking Will Elias (drums) Deil opened with Lullaby of Birdland followed by Autumn Leaves. At this juncture a beaming Ms Deil addressed the audience, taking the opportunity to introduce Jackson and Elias. Bassist Jackson set tempo and feel on Misty and it was noted that throughout the set Ms Deil used lots of left hand, melody to the fore, searching for an opportunity to improvise without stretching out too far. Have You Met Miss Jones? then Black Orpheus. All good, then a change in mood – Wayne Shorter’s Footprints. Good! Jackson’s bass line just right. Deil’s set drew to a close with Afternoon in Paris and Witchcraft. A work in progress, be sure to catch Juliane Deil at a DU Jazz Soc jam, or, with a bit of luck, in Newcastle at the Jazz Café’s legendary jam session.